"Looking forward to many returns to the most spectacular waters of Rose River Farm where the water is cold, the trout are athletes, and the people are good friends." Click on pictures to read more about the picture or to follow us on Instagram. Rose River Farm Friends, The fishing this fall has been quite good with excellent water levels and strong flows. Hoppers, crickets, Adams, orange stimulators and midge patterns have been effective top water flys. Nymphs such as prince, hares ears, flash backs and zebra midges have been very productive. Often we like to fish them as droppers on 2 feet of 5X tippet below a hopper. Rose River Specials, Golden Retrievers, small black buggers and San Juan worms have also been good choices. We have booked up very quickly for the fall. October and November fly fishing is almost completely booked. We do have a few December openings still available. Also please consider booking your January and February dates now as they are filling up and the Farm fishes great all winter. A few years ago we also began offering luxury rental cabins for both our fishing guests and for those who just like to escape to the beautiful Blue Ridge Mountains. For cabin rentals please go to the Rose River Farm Cabin Booking Calendar for availability and booking. All booking is done online at the Farm website which is fully automated and available 24 hrs a day. We still have a couple of November Sunday nights and midweek dates available--foliage is looking great. We also have a couple of weekend nights open in December. Please note that we have not opened the general fishing calendar beyond the end of February at this time. You can get an early start and book spring dates now with a cabin rental-- email us for available dates. We will open the spring fishing calendar for general booking sometime after the first of the year. We have an exciting fall charity fishing event on October 28 to benefit The Mayfly Project. Please see below for more details. The cabins have proven to be a huge hit with fishermen and those just looking to escape to the mountains for a couple of nights. We have hosted a few company retreats and a number of "sales and customer appreciation" events. We have even had a few small weddings. We are happy to assist you in planning any of these kind of special events. 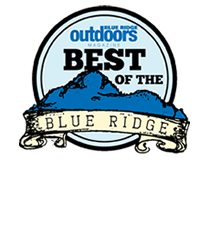 We can help you arrange activities like fly fishing lessons or even preserve bird hunting or sporting clays. We can recommend great local catering or restaurant choices. The cabins are really unique with their 17 foot ceilings and round walls. All booking can be done online at the Farm Website cabins page. The cabins are 2 bedroom, 2 bath, with 2 double beds in each bedroom. They have a full kitchen and a living / dining room with leather club furniture and a nice big round table perfect for a little cards after a day on the River! There is also a 42 inch Sat TV with DVD player- the cabins are first class in every way. Please go to the Farm Website to see pictures or the new promotional video. The cabins are perfect for a weekend get-a-way, hiking Old Rag, the SNP, doing a wine tour or just relaxing in the mountains. The cabins are very private as they are located on a separate 20 acre parcel that is catty corner to the main Farm property. Don't forget that some of the best public trout waters are just minutes from the cabins - The Rapidan, White Oak Canyon, The Conway and the Upper Rose to name just a few of the nearby opportunities for native Brookie fishing. There are also great smallmouth opportunities and shad fishing all less than an hour from the cabins. We have guides available for all of these waters or can point you in the right direction to fish on your own. You do not have to fish the Farm to stay at the Cabins. Join us at Rose River Farm, Sunday, October 28 for the Inaugural Foster the Rise 2-Fly Tournament to support the mission of The Mayfly Project; to mentor children in foster care through fly fishing. The goal of TMP is to connect kids to a rewarding hobby that provides an opportunity for them to have fun, feel supported, and develop a meaningful connection with the outdoors. Anglers will vie to win prizes from TFO, Cortland, St. Croix rods, and more! There will also be a silent auction, raffle for a Riversmith River Quiver roof top rod holder, and lunch. Visit their website to Register or for more information or contact Mollie Simpkins at mollie@themayflyproject.com. Jerry Nonnemacher has recovered from his hand surgery and is back in the workshop building the finest bamboo rods available. Any of these can be finished in time to put under the tree if you order now. Lots of rods ready for buildout including 6 four piece Travelers, 1 three piece Spruce Creek and 4 2 pc, 2 tip Spruce Creeks, 7 1/2'. 1 4 pc. 2 tip Spruce Creek, 1 4 pc. 2 tip Spruce Creek Light and 1 4 pc. Travelers, 2 trout Bums, 8', 1 big horn trout bum, 8' 1 spruce creek, 1 spruce creek light, 1 hog slayer, all 7 1/2'. 2 tip Trout Bum 8' all available for custom build out. Pricing, 1650.00 on two piece, 1750.00 on three piece and 1950.00 on the Travelers less 10%. Build out six weeks from deposit. Email us to get your hands on one of these fantastic bamboo rods!!! If you are looking for live music when staying at the Cabins be sure to check out Early Mountain Vineyard (live music on the patio Friday, Saturday and Sunday), DuCard Vineyard (live music most weekends), and the brand new State Theater in Culpeper (regional and national acts). Of course Charlottesville is also a great music venue and the outdoor nTelos Wireless Arena, The Parmount Theater and the JPJ Arena are all only about a 45 min drive. The Hook & Hackle Company is one of our favorite online fly shops. They have become an international leader in helping fly anglers do what they call "flycraft," which is making their own flies and making their own rods with Hook & Hackles help. Their web store has become one of the most popular destination for anglers 'fishing' on the web to purchase the highest quality products available at very reasonable prices. You can visit them at www.hookhack.com. The Hook & Hackle company is dedicated to fly fishing education -- for over 38 years! 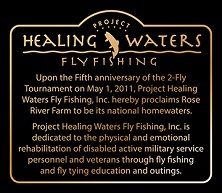 Hook & Hackle also carries Project Healing Waters Shirts and Hats. Madison and the surrounding counties have become major players in the Virginia wine scene. Close by wineries include DuCard Vineyards (the closest to the Farm and one of my personal favorites-- Cabin guests ask about a complimentary tasting coupon for two), Sharp Rock, Early Mountain (recently purchased and beautifully renovated by AOL founder Steve Case-- now serving food too), Prince Michel, Barboursville, Rappahannock Cellars and Grey Ghost Vineyards just to name a few. Our winery has tastings by appointment as well. The Farm Website Cabins Page has many links to wineries and other nearby restaurants and natural attraction like Old Rag Mountain, White Oak Canyon, Camp Hoover. 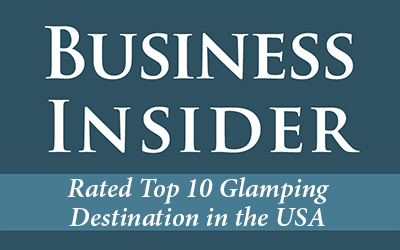 Stay at the cabins and make it a wine, hiking or fly fishing mini vacation. Check out our new google map found on the cabins page of our website for more details. "We could not have picked a better time and place for a weekend vacation with the family. While many families may pass on the thought of going on a trip to a fishing cabin, the yurts at Rose River Farms are a family-friendly luxury. There are many nearby outdoor activities that do not require a fishing rod. The peacefulness and the idyllic setting is a much needed reprieve for everyone." Joel R. Johnson is a writer, conservationist, veteran brand strategist, amateur genealogist, and passionate angler living in Clinton Hill, Brooklyn with a wife and a cat named Ninja. NBC Sports as part of their Sunday Night NFL Toyota Halftime show picked PHW to be the charity of the week. The sent a camera crew out to the Farm and filmed PHW in action. Toyota awarded PHW $10,000 and played a short version of this video durring the Sunday night broadcast.